If you don’t know who your trainer is, or have any concerns about your trainer, contact Zachary Coulombe at zac@robots.education or Dennis Kambeitz at dennis@robots.education. There are a couple of things you need to do to be ready for when the webinar begins. Due to the nature of how EZ-Robots function and connect, it’s important to learn exactly what you need to be successful. A computer that can connect to the internet, and has a microphone. A laptop works well. A computer that can connect to WiFi, or has a WiFi dongle. A microphone is also preferred. A laptop also works well here. Alternatively, if you have a WiFi dongle, you can plug it into a laptop in order to be able to have the webinar and the EZ-Builder on the same computer. However, this can make it difficult to follow along and program the robot at the same time, as the webinar frequently demonstrates things in conjunction with the audio description. Another alternative is to have a desktop computer with a wired Ethernet connection and a WiFi dongle to connect to the robot. The same issues as in the configuration above may be present in this configuration. ​Robot assembly instruction and care videos can be found at www.ez-robot.com/tutorials. The exact relevant lessons for each robot can be found below. It is best to review all the videos and follow their instructions before the day of your training webinar. ​​Each computer only takes a few minutes to setup. If you are using the alternative computer configurations for step 3 on the first page, combine both setups into one. This is the computer you will use to listen/watch the webinar. You will need to ensure that it has an internet connection and a microphone. Find the icon on your taskbar that looks like a small speaker. Right click on the icon and select “Recording Devices”. 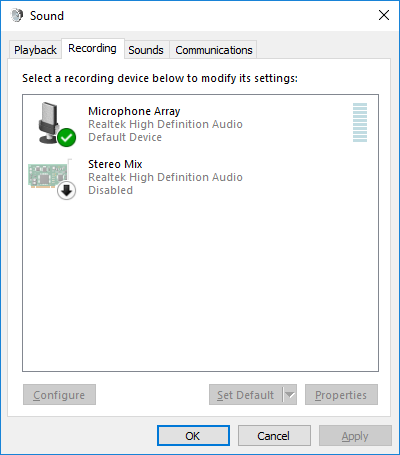 If you do not have “Recording devices”, it is likely that your computer does not have a microphone. Look for a microphone device. Example below. Your trainer should have provided a link to the Zoom Meeting in an email. All you need to do is click on the link and follow the instructions on screen. If your trainer provided only an ID number, go to https://zoom.us/join. Follow the instructions on screen, and enter your ID number when prompted. Your first computer should be properly set up and ready to go now. This computer will be used to program the robot with. You will need to be able to connect to the robot using WiFi, and having a microphone is preferred. You will also need to have EZ-Builder installed. A laptop works best for this computer. Use the steps above to determine whether your computer has a microphone or not. If you do not have EZ-Builder installed, or you are unsure, refer to the Setting Up EZ-Builder Guide located here. If you experience any issues or problems with this setup, please contact your trainer as soon as possible. If you are unable to reach your trainer, then you may contact zac@robots.education or dennis@robots.education. Please note that assistance is limited by time. The earlier you contact us, the better we can help. You can also refer to more tutorials at www.ez-robot.com/tutorials if you are unsure about any setup instructions.